Decorative pillows can instantly turn a basic sofa into the extraordinary, and a standard bed into a relaxing oasis. Not only do they boost comfort and coziness, but they can double as statement-making focal points. Whether you are looking to add a riotous hit of color to a room, elevate soft furnishings, or bring in bold patterns, our designers compiled a list of go-to decorative pillow styles to illustrate the trendiest decorative pillows for 2019.
Who says that decorative pillows need to be purely about aesthetics or comfort? To make a memorable statement, source pillows that mean something to you or represent a facet of your lifestyle you want to share. From sports team motifs to your favorite breed of dog, there’s an endless array of options and routes to consider that will make your home as unique as you are. Celebrated for their bold, recognizable prints that evoke pop-art, Finish label Marimekko’s most infamous print has to be it’s timeless poppy print. Vibrant and playful, textiles from the label are versatile enough to easily be paired with a myriad of design styles, from warm minimalism to the traditional. Another label famous for it’s signature prints and weaves, Italian heritage knitwear firm Missoni makes probably the most covetable and recognizable decorative pillows on the market. Pop one of their statement-making decorative throw pillows anywhere in your home and wait for the compliments to ring in – they are that beloved. Psychedelic and forever-cool, every year Italian sportswear label Pucci creates limited edition velvet throw pillows that add a sense of play to any room, and never lose value or go out of style on top of it. Long gone are the days of 80’s era decorative throw pillows that are so upright that they ward potential guests away. Instead, look for decorative pillows that evoke a relaxed yet stylized spirit and let them sit naturally on a surface rather then coming off as too calculated in placement. And do create a mix of patterns as illustrated above. The take-away here is to keep a common thread between the mix, such as the muted blue running through each pillow. When it comes decorative pillows, there’s an endless amount of options to chose from at a variety of price points. From scale to fabrications, you can virtually go in any direction. But ones that will make even the most standard of basic couches come alive? Patterns please! Get expressive and experiment with patterns, from the bold to the minimal, and do switch them around each season for a quick room refresh. All the rage over the past few years, we’ve seen shag come into the world of interior design via rugs, tapestries, and now stylish decorative throw pillows. Though they have an impractical appeal about them, they are a great way to add texture and intriguing visual interest in any room. Even better when they are mixed with non fur or shag pillows to highlight their beauty. Though you may shy away from expressive patterns in vibrant hues and eclectic finishes, there’s no harm in bringing in bold decorative pillows for the ultimate statement. Plus, since they are a small item that shouldn’t break the bank, go ahead and take risks – you might just surprise yourself in the mix. Want to add a global, eclectic feel in your home without having to go full force? Consider bohemian decorative throw pillows as a stylish way to channel that global energy in your home. 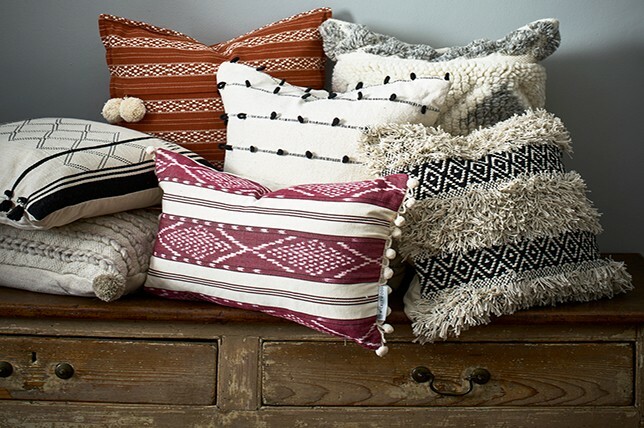 From beaded to fringed to tasseled, there’s plenty of fun to be found with bohemian inspired throw pillows. Need extra seating but don’t want to take up too much floor space while investing in bulky furnishings? Seat guests on easy to move floor pillows as a savvy alternative. The best part about floor pillows? The endless options of course! From bohemian to minimal, there’s a style out there to suite your home and tastes while adding enviable comfort in the mix. For something a bit more traditional and regal to boot, gothic inspired decorative pillows from the likes of heritage labels like Gucci are certain to add an appealing elegance thanks to their velvet fabrications, gilt embroideries, and symbolic motifs. And while these may cost a bit more than other options, there’s no denying the heady upgrade they’ll add to even the simplest of rooms. If bold color is not for you, you can easily source cheap throw pillows featuring a decorative graphic print thats timeless yet eye-catching all at once. To get the most use over time, our decorators suggest sticking with classic black and white prints as they’re easy on the eye, take little care, and pair well with every design style. To really tap into everyday glamor with ease, opt for bold art-deco inspired decorative pillows that feature graphic symmetrical designs that are certain to never go out of style. From the perfect Hollywood Regency styled pillows to ones that evoke pop-art, the sky’s the limit. When looking for cheap throw pillows that don’t come off as so, consider looking into batik and tribal inspired blue throw pillows as they are easy to wash and maintain, and can instantly lend any room an exotic feel. When it comes to decorative pillows, its more about your personal taste then what’s on trend. Are you immediately drawn to pastels? If so, a smattering of pastel hued pillows will give a sofa a softened, more approachable feel. Though often the most expensive and impractical of all decorative throw pillows, there’s something to be said about the beauty of delicately beaded throw pillows that are certain to add a high-dose of easy, everyday glamor to any room. When it comes to decorative pillows, have fun with it! Be bold, be playful, be experimental. The easiest way to do this? Source pillows boasting unexpected and intriguing fringe for a touch of elegant bohemia. A nod to old-school glamor, flocked decorative throw pillows are an easy route to old-world elegance and are comfortable and sturdy to boot. We love the subtle contrasting tones of the ones pictured above. When it comes to affordable decorative pillows, do create a mix of different styles as together they’ll look all the more polished. Otherwise on their own, cheap throw pillows will look just that. There’s something undeniably ultra-chic about a velvet pillow in a solid hue, isn’t there? We don’t know what it is, but we do know that they are all kinds of glorious, scattered about your sofa. Perhaps it’s something to do with the shine of velvet, or the texture of the fabric? Whatever it is, we love velvet decorative pillows, especially in deep, rich tones, to add a touch of luxury to your soft furnishings. Imagine dark greens and purples, deep blues, and bold gold. Square throw pillows are the best silhouette for velvet, and the bigger the better – you can arrange them with smaller throw pillows in contrasting colors and fabrics. Unique, interesting and fabulous; mudcloth prints have been all the rage this year and we see them being celebrated well into 2019. They’ve tended to be pretty neutral, with all the visual energy coming from the eye-catching prints, which are always on trend. Neutral base colors with black patterns (and vice versa) have been stealing the show, and you can see why. Mudcloth print decorative pillows really stand out from the crowd and they look great alongside one another, contrasting and co-ordinating to make the perfect throw pillow sets. These have a super natural and authentic feel to them and would be perfect if you are going for a bit of an eclectic ‘world traveller’ vibe in your home. Less formal than cottage-style stripes, these uneven striped decorative throw pillows make a vital impact. They have the effect of stripes having been painted on by hand and are reminiscent of tiger or zebra stripes, but without feeling too animalier. They look great in bold contrasting colors, such as grey and coral, adding to the abstract feel of these decorative pillows. Pillows like these will add a touch of artistic relaxation and vibrancy to any room. Sateen has made a comeback and we are so into the soft, shiny, luxuriance it brings with it. Sateen always looks gorgeous in deep jewel tones, but we are especially loving it for blue throw pillows. From soft light blues, to bolder dark blues, sateen throw pillow sets are a go-to for 2019. They look great as square throw pillows, and exceptional as rectangular lumbar throw pillows – there’s something about the dip in the middle being accentuated by the longer line, that looks simply stunning in sateen. Cottage-style striped decorative pillows can be as colorful or as subtle as you like; with this style of decorative throw pillows, there are so many options and no end of styles. Whether you want thick stripes, thin stripes, sporadic stripes or countless stripes, there is a cottage-style striped pillow out there waiting for you. If you like to keep your tones neutral, you will be in your element choosing cottage-style throw pillows. They are perfect if you are edging towards a nautical theme too (there are plenty of blue throw pillows available) and are great if you are going for a relaxed neutral theme too. They are simple and fun at the same time, adding an eye-catching square of stripe to your room. Floral embroidery has always looked stunning on decorative throw pillows but has fallen out of favor over the past decade. We are pleased to announce its comeback, as there is nothing more exquisite than a hand embroidered throw pillow perched on any surface. The colors are often bold and vibrant and will create a striking impact in any room. If you are looking for shots of vibrant color, floral pillows are an essential option to consider. If you want to try your hand at a bit of embroidery, and get crafty with some at home embroidering, it’s a great hack for cheap throw pillows, as embroidered pieces can be expensive. Plus, you’ll have something that’s truly one of a kind in your home. You might not immediately think of leather when you are thinking about designer pillows, but they do boast handsome sturdiness. Soft light brown suede is great for a comfortable and stylish pillow, and a darker, more traditional leather will give a masculine edge to soft furnishings while helping to define a room. If you’re on a budget, you can pick up cheap decorative pillows in faux leather, that will give you a strikingly similar effect. Leather is great for large overstuffed pillows that you can throw yourself onto at the end of a long day. Choose leather decorative pillows with fringe, to own the leather look while adding more texture for a rustic spirit. Ruffled decorative pillows add a decidedly feminine touch with a flourish. If you are looking to embrace femininity in a room, then a set of well-made ruffled pillows are a great way to go. You can make your bed feel fit for a queen with a selection of delicately ruffled cushions, or you can keep it calm with neutral tones, such as grey. A more monochrome tone will still give you a feminine feel but without giddy frills overtaking your room. They make for a pretty addition to soft furnishings and can be as flouncy as you want them to be. Gold and bronze tones are forever trending, and for good reason. A warm metallic tone is unbeatably glamorous, adding a soft and luxurious element to any area with ease. Looking great alongside other metallic hues, neutrals and whites alike, champagne hued decorative pillows will also instantly add a luxurious (yet light) touch to any bedroom or living room. In velvet, sateen, stripes, or pleats, bronzed hues are also a fail proof option – they’re gloriously warm and elegant to boot. Evoking a light and breezy, soft and muted feeling is what watercolor throw pillows are all about. They’ll add key visual interest to any room and can be as bright and as bold as you like, or as mellow and subtle as you prefer. There are so many beautiful floral designs available at the moment, but if floral prints aren’t for you, consider birds, butterflies, stripes, and abstract designs as stylish alternatives.